Once upon a time, there lived a goose. 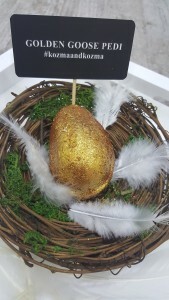 Instead of white eggs, lays golden eggs. 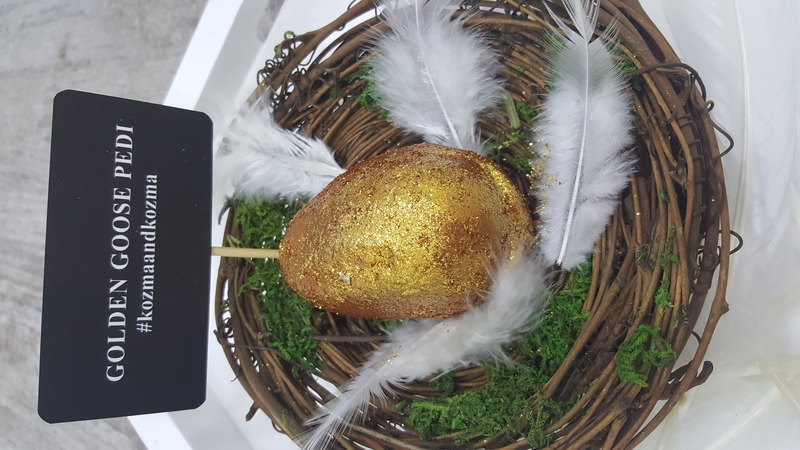 During your pedicure, you will be presented with one of these exquisite golden eggs (very Instagram worthy presentation) which we will drop into your foot bath. This egg looks like it belongs in a museum, sitting amongst the Fabergé collection. This pedicure is “EGGcellent” for gold and glitter lovers. When detonated, the egg releases dazzling sunlight and butter cream into the water, which is also extremely moisturizing. Bergamot and wild orange oils tone and brighten skin, cocoa butter gives you an intense hydration kick. Sweet almond and honey fragrance drift up from the water to relax you. The opulent experience does not stop there. After your soak, you will be treated to a golden scrub and golden hydrating mask. Finish with a perfect polish. Oooh, hold on! One more surprise awaits! The egg has hatched! It’s a small gift for you to take home! That is one talented goose.